When it came time to restore a 107-year-old treasure in Boston, Stromberg was called in for GFRC elements. For this bank in Broken Bow, OK, Stromberg crafted a large custom buffalo sculpture entirely in bronze. At the Alabama School of Math & Science, Stromberg columns add class to the campus' newest academic/recreational building. Using durable and weather-resistant GFRC, our team produced attractive cornice for this college's new residence halls. Close to 2,000 custom architectural GFRC blocks were crafted and installed by Stromberg to develop this store's rain screen. 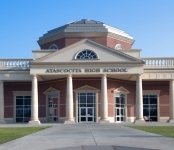 This Texas high school's new balustrade, cornice, and columns were all crafted from lightweight GFRC. Stromberg used GFRC to create half columns and pilasters, which gave this Ohio restaurant's exterior a truly distinctive look. For the Ave Maria Oratory in Florida, Stromberg crafted panels that have a stone texture and offer superior acoustic performance. Architectural concrete was the material of choice for this project, which involved crafting columns, bases, and capitals. The ceiling beams at Cabelas look like real wood, but were actually constructed from lightweight Glass Fiber Reinforced Gypsum. Relying on our extensive knowledge of the classical orders, we used GFRP to craft Corinthian columns and matching pilasters. Thanks to the unique properties of GFRC, Stromberg was able to reproduce this country estate's original columns. These basic columns designed and crafted for Castle Pines were made from weather-resistant and lightweight architectural GFRC. Working with architectural fiberglass, GFRG and GFRC, we crafted elements that reflected this business's distinctive flair. Stromberg-crafted GFRC molding and panels transformed this Ohio storefront into something truly stylish and eye-catching. Five colorful GFRP sculptures - three giraffes, a hippo, and an ostrich - were custom designed and installed by Stromberg. 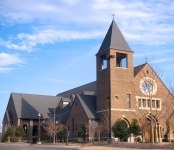 Stromberg's GFRC columns were the obvious choice for this landmark Memphis church. When the Cinemark wanted to liven up the appearance of the Gulfport, MS theater's front entry, Stromberg columns were the perfect solution. We used cast stone and coral stone to enhance the outside of this inn, which would appeal to the most discerning guests. Stromberg columns help to define the character of this building named for a groundbreaking leader in education. In 2006, Stromberg crafted several imposing Greek Corinthian columns from architectural GFRC for this Texas school. This large project involved custom designing and painting sculptures, archways, and pilasters to capture the spirit of Hollywood. New GFRC panels and cornice drastically improved the aesthetic appeal of this Alabama coliseum's exterior. New columns, cornice, and covers designed to work perfectly with this university's distinctive architectural style were crafted in 2006. A lightweight, low maintenance, and moisture-resistant clock surround was fashioned using Stromberg architectural GFRC. Conecuh County's new government center features GFRP elements manufactured by Stromberg Architectural Products. An example of a by-gone architectural era, Stromberg provided replacement elements to keep the example shining. This massive project involved producing hundreds of custom columns, as well as Cast Stone coral trim, scuppers, and domes. Some of the elements Stromberg has produced for this long-time client include GFRC trim and panels that emulate Indiana limestone. Greek Corinthian columns of various sizes were made using architectural fiberglass during this ecclesiastical project. When Dallas Area Rapid Transit needed a durable material for the amenities at their high volume rail stations, they turned to Stromberg GFRC. The stately GFRC columns made by Stromberg feature a smooth texture, and are a vital part of this building's elegant exterior. These unusual Stromberg-produced rope columns welcome visitors to the Dawson County Library in Georgia. Using architectural fiberglass, Stromberg built a clock tower, Corinthian columns, and attractive cornice for the DBU. This water feature project involved manufacturing several custom abstract sculptures made entirely from architectural fiberglass. During this project, we designed custom fascia panels and cast nearly 750 feet of GFRC panels and cornice. Stromberg's oversized columns in GFRP set an aesthetic tone for the interior of the Faith Chapel Christian Center in Birmingham. We used architectural concrete to make new columns, column covers, and column capitals for the FDC Seatac in Washington. Stromberg flawlessly recreated over 2000 building pieces to help restore this bank to its original appearance. To make this Fendi storefront as exquisite as the products inside, we produced fluted columns, a dome, and eye-catching molding. For this San Antonio theme park, we produced numerous elements to accentuate the attraction's early Spanish ambiance. Fluted Ionic architectural concrete columns were made by Stromberg and finished to match the surrounding classical church. 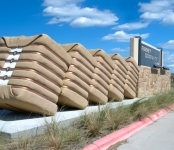 Sometimes architectural products can be downright fun, such as creating the cotton bales that welcome families to the community park in Forney, Texas. The restoration of this historic Georgia building was successful thanks to Stromberg's advanced materials and molding process. These appealing Stromberg-crafted GFRC parapet panels stood up to the awesome power of Hurricane Ike without sustaining damage. Tuscan Cast Stone columns and architectural fiberglass cornice were crafted to support the gazebo's magnificent iron dome. In 2004, Stromberg created 83 architectural concrete bollards to control vehicle access and protect the safety of pedestrians. Stromberg cornice and panels enhance the interior and exterior of the Georgetown Council Chambers. Stromberg GFRC columns are a prominent feature at the historic campus of Georgia College and State University. Everything about this Texas courthouse is unique, including the Cast Stone cupola built by Stromberg in 1996. Using architectural fiberglass, Stromberg's experts were able to craft several colorful and realistic sports-themed sculptures. This storefront was transformed into something memorable with GFRP valance panels, surrounds, and parapet caps. We transported the Hershey store back in time by producing more than 100 pieces that simulated brick from the early 20th century. Renovations to this expansive courthouse's columns and cornice were completed using lightweight and tough architectural concrete. Working with cast stone and advanced composites, Stromberg crafted fountain rings, cupolas, and columns for these Texas condos. The façade of this library was greatly enhanced by Stromberg-made GFRC architectural panels, sills, and caps. From the columns of the sanctuary to the pulpit itself, Stromberg quality enhances this Baptist church in Atlanta, GA.
Diamond medallions, custom cornice, lintels, and numerous panels were all made for this store specializing in fine jewelry. Using Cast Stone, Stromberg's renovation team was able to restore this impressive structure's columns to their original splendor. This inn's ringed fountain featuring detailed horse sculptures was renovated by Stromberg with GFRS and architectural concrete. Newly-constructed cast stone and GFRC panels, balustrade, surrounds, and fireplace mantels were all part of this project's scope. To complement its 2006 building addition, this elementary school chose GFRC cornice designed and manufactured by Stromberg. This notable Orlando hotel features a Stromberg-designed and crafted cupola and dome made from architectural concrete. Stromberg used weather-resistant and versatile GFRC to craft new architectural cornice for this Oregon library in 2004. We built a magnificent entry arch reminiscent of an ancient stone structure featuring tiger sculptures and dolphins in bas relief. The entire façade of this building was revamped with Stromberg columns, roof panels, bases, cornice, and entrances. Strong, lightweight, and fireproof GFRC pilasters were custom designed and crafted for this award-winning campus building. Using architectural precast, Stromberg's experts were able to create coping and panels to enhance this building's exterior. Columns, cornice, and balustrade were designed and cast in GFRC to add to this historic building's original design. To complete the traditional Georgian look of this building, Stromberg crafted GFRC Tuscan columns, balustrade, fountains, and more. A realistic stone finish was applied to the various GFRP elements made during this project, which included balustrade and columns. 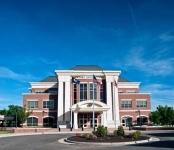 The sturdy railing seen on this courthouse was crafted from durable and moldable architectural fiberglass in 2002. In 1997, Stromberg helped make this casino more inviting for guests by renovating its pilasters, arches, columns, and keystones. Stromberg's stained glass wall panels, surrounds, trim, and moldings are all crucial components of this resort's exotic flair. Stromberg used architectural fiberglass to create fixture pieces and stately lion sculptures to welcome patrons. In 1992, Stromberg built a port cochere from Cast Stone for this medical facility to protect vehicles and patients from the elements. Architectural concrete was used to produce lightweight custom cornice for this impressive Georgian-style building. Custom antique statues, bas relief, spires, and fountains were developed with this mall's distinctive Mediterranean theme in mind. This courthouse's bollards, constructed of GFRC, enhance both the security of the structure and its visual appeal. For the national park in Kuwaihae, Stromberg provided a solution that was agreeable to both the client and the ancient island spirits. This complete balustrade system was manufactured and finished to complement the building's accents and its brick façade. When REI wanted visual impact at their new Round Rock facility, they chose GFRP panels that recreated mammoth-sized stone blocks. Stromberg provided columns for the top name in home d�cor in one of Cincinnati's most prestigious shopping centers. Stromberg wall caps and finials provided the crowning touch for the exterior design of this apartment community in Conway, AR. Using architectural concrete, we were able to mold durable columns and panels quickly and precisely for Rose State College. The Stromberg-constructed custom spires and bases on this student housing complex are undoubtedly the building's focal point. We renovated this building's cornice and panels in 2006 to ensure the structure would retain its splendor for years to come. Our work is a vital part of this splendid building's design, which features medallions, sculpture, and gold-inspired railings. Thirteen GFRP panels were custom designed and constructed to create an awe-inspiring replica of the night sky. Several custom GFRP domes, including one inspired by a lantern, were manufactured for this notable Colorado plaza. A single cornice and more than 2000 marble-inspired panels were completed during this huge undertaking. A marble baptismal font and an ornate Baldachin featuring columns, a dome, and a religious sculpture were crafted for this church. 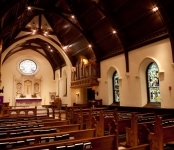 Strombergs GFRG panels helped to restore this beautiful historic church following a devastating fire. Textured architectural fiberglass architectural domes were finished with a bold red hue and crowned with ornate crosses. The construction of St. Mark the Evangelist allowed Stromberg the opportunity to display the intricate design possibilities of GFRG. Most notable among the elements crafted by Stromberg for this parish are the numerous identical columns surrounding the structure. This massive renovation project involved molding more than 3,000 pieces designed to match the original structure exactly. Stromberg used architectural concrete (GFRC) to cast new pilasters for this retail giant's storefront in 2005. Stromberg's GFRC elements on Stephen F. Austin's new $30 million student center deliver style with the added bonus of durability. A cross made of Stromberg GFRG provides the sanctuary of this Alabama church with a simple, yet elegant focal point. This important renovation involved not only restoring existing elements, but also working with historians and conducting research. Stromberg's architectural GFRC coping, panels, and trim helped to add appeal to this historical Texas university's façade. The columns, cupolas, and surrounds developed by Stromberg work together flawlessly to create a coherent exterior design. The celebrated bas relief soldier wall in The Pentagon was crafted with adaptable and lightweight Stromberg GFRG. Stromberg's GFRP elements combine Colonial-inspired styling with extended durability at this Tennessee bank location. Panels and wall caps were crafted from architectural concrete to make this university's exterior less monotonous and plain. 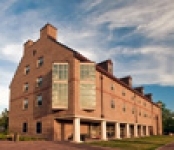 When renovating a historic college campus, quality is the highest priority. Stromberg offers the highest quality in the industry. Columns and cornice crafted by Stromberg were finished in identical colors to ensure they would work together flawlessly. This building's classical columns create a grand entryway. They were meticulously renovated by Stromberg in 2005.